Distracted and impaired driving are two of the biggest hot topics on the roads today. According to the Ontario Provincial Police (OPP), distracted driving was the number one cause of deaths on Ontario roadways in 2016, even though stiffer fines have been set. The fines and demerit points vary across provinces. British Columbia has the highest fine for a first-time offender at $543 with four demerit points, while New Brunswick is the most lenient at a fine of $172.50 with three demerit points. Yet the number of fines doled out each year consistently increase, involving people of all ages. To implement a mindset change, it's important to start this process at a young age, and that's what Ford Canada is doing through its Ford Fund charitable arm in a program called Ford Driving Skills for Life. This year, Ford is partnering with Parachute, a national charity that helps Canadians stop the clock on predictable and preventable injuries. 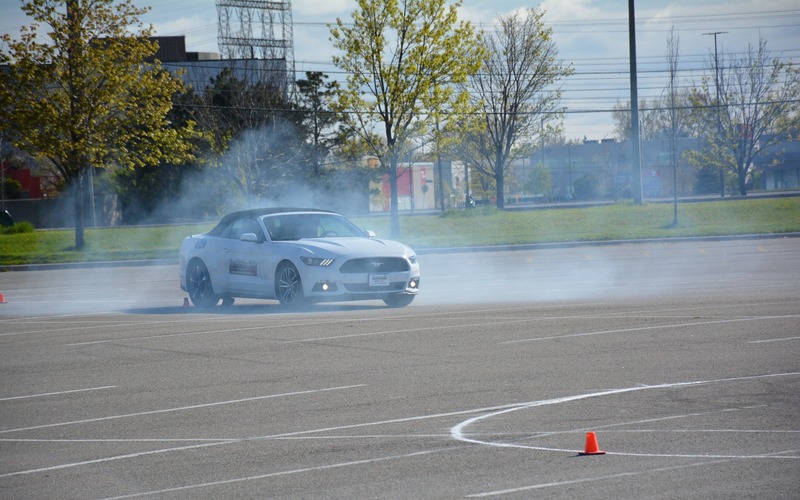 In this age of multitasking, Ford simply doesn't teach and show necessary skills for safe driving beyond what is touched on during driver education programs; they put the student in the driver's seat along with a high-performance professional driving instructor by their side as they learn different techniques and manoeuvres. These exercises go further than distracted and impaired driving with numerous first-hand accident avoidance tips learned throughout the day. “Ford Driving Skills for Life is a natural fit for Ford between building cars with safety features and wanting to train young drivers with essential driving skills,” says Caroline Hughes, Vice President, Government Relations, Ford Motor Company of Canada. During this half-day session, students are brought in from local schools at no cost and educated by both professional drivers and local police officers on four different driving exercises: impaired driving, distracted driving, hazard recognition and vehicle handling. It may all seem very classroom-oriented, but Ford utilizes a few tricks up its sleeve including drunk, drugged and hangover suits, as well as seat time in a new Ford Mustang. “We use all types of distractions from getting them to text out messages to turning up the radio, as well as conversations from back-seat drivers,” said Dave Drimmie, lead instructor, Ford Driving Skills for Life. It was clearly evident that these in-car distractions were immediately overwhelming, even though these students were trying hard to focus and obey the stop signs, directions and pylons. The same situation was found in the impaired driving section where students drove a handling course first on their own at low speeds, and then a second time while wearing impaired goggles. This was something that needed more hands-on experience, so I took the opportunity to hop into the Ford Edge and see how my driving skills are while intoxicated. Waiting for me in the passenger seat was a member of the Toronto Police Force – a great addition to the program, allowing students to interact with authority on a friendly basis. After immediately putting on the goggles, I was instantly met with dizziness, especially when moving my head side-to-side. I managed to put the vehicle in drive, and that wasn't even at full confidence. My driving skills were a little bit better than the students before me, but that had a lot to do with surveying the pylons and using memory of prior handling course experience; and that still had me knocking over a few pylons. “People overestimate their abilities when impaired or distracted, and that's what these exercises prove,” adds Hughes. The last two sections shifted from voluntary impairments and focused on advanced driver training. This was where students partook in ABS braking exercises, evasive driving manoeuvres, all while improving on their reactionary skills. Understanding the capabilities of your vehicle are imperative, and only through experience would one learn these basics – something that the majority of these new drivers knew nothing about. Feeling ABS brakes kick in and getting familiar with stopping distances showcase to drivers why driver education classes preach against tailgating, being aware of your surroundings, and driving at a safe distance behind another vehicle. Lastly, the pièce de résistance involved sliding Mustangs around a handling course. These weren't just any Mustangs, but ones specially-built with castors on the back of the wheels to simulate oversteer, while traction control was turned off. The professional instructors taught the basics of steering into the skid, as well as how important it was to look where you want to go rather than where the vehicle is headed. “Some might think they are invincible, but there are so many things that can be encountered on the road, and we're trying to provide these students with these experiences in order to handle those situations in the future,” said Hughes. Ford Driving Skills for Life began in the United States in 2003, and has been in Canada for the last four years. For 2017, it has completed stops in Montreal and Toronto, and will now head to Calgary and Edmonton in the fall.